Free-standing hybrid riser (FSHR) systems are proven solutions for deepwater production. FSHRs require buoyancy tanks, carrier pipe joints, tapered stress joints, off-take spools and flexible connectors. 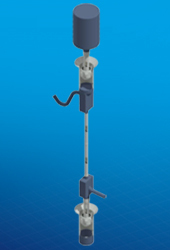 Oil States’ RotoLatch™ and RotoLok™ connection systems combine the benefits of a self-guiding, self-actuating system with the flexibility of an integral flex element to achieve an outstanding, field-proven system for riser tower applications. 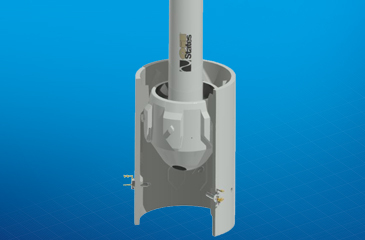 The system utilizes two main components, the flexible elastomeric connector (FEC), which is welded to the riser tubular, and the cylindrical receptacle that is welded to the suction anchor. The system includes a patented secondary-locking mechanism to negate inadvertent connector release due to loss of tension. With 100+ units supplied, installed and currently in service, Oil States has the experience required to ensure a successful, on-time project. Proven performance: 100+ units supplied, installed and in service right now. Patented secondary-locking system to negate inadvertent connector release due to loss of tension. Different sizes available dependent on loads. The Oil States Collet Connectors provide a robust and easy-to-install connector for deepwater installations. 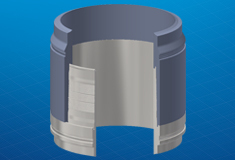 Where performance and deepwater reliability count, the Oil States Collet Connector has been delivering proven connector technology for over 25 years. The collet connector utilizes a rough-landing alignment shroud and guide funnel for initial landing. Once in place, the soft-land cylinders provide final alignment and mating of the sealing surfaces. 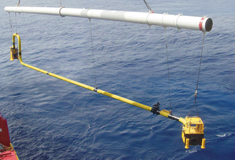 They also provide sufficient vertical clearance for subsea seal change-out procedures. The drive ring locks the collet fingers over the male hub for a permanent connection. Seal testing is verified by ROV interface on the integral or retrievable control panel. The panel uses dual-bore, dual-port hot stab couplings for all functions, with visible indicators to verify all function operations. The typical connection can be completed and tested in less than 30 minutes, excluding the running time. See Collet Connector animation here. A proven, versatile design with standard configurations for almost any application. Fast installation and immediate testing via ROV results in lower installed costs. Metal-to-metal sealing with one of the highest external pressure ratings in the industry. Available in vertical, horizontal and annular styles, with integrated or retrievable control panels/running tools. Oil States’ Merlin™ connection, in service since the mid 1980s, has been field proven in a variety of applications including: casing, conductor, TLP tethers, drilling and completion riser, caissons and FPSO turrets. It features non-rotational makeup with dual metal-to-metal seals and is safely and rapidly assembled using customized makeup tooling. Merlin™ connectors are manufactured and inspected to extremely tight tolerances, which allows us to carefully control the level of pre-load in an assembled connector. All radial and axial pre-load is generated solely by the geometry of the connector. It is not subject to any of the uncertainty found in rotational connectors due to torque and friction effects. The high, controllable level of pre-load, together with the slim-line profile of the connector, ensures exceptional fatigue performance in the harshest of environments. See Merlin™ connector animation here. See Merlin™ Double Groove connector animation here. Over 40,000 Merlin&trade; connectors supplied, installed and in service today. Extensively tested including pressure, bending, tension and fatigue. 100% dimensionally checked as standard. Available in 6.625″ to 72″ for a variety of applications.